← DTI eBook Super Sale! The Awataguchi main line was continued by Norikuni’s eldest son Kuniyoshi (国吉) of whom no first name is handed down, although we know that he bore the honorary title Sahyôe no Jô (左兵衛尉). Just to let you know, the Kotô Meizukushi Taizen says that he was born in Genkyû one (元久, 1204) and that he died in Bun’ei four (文永, 1267) at the age of 64. Traditionally he is dated around Hôji (宝治, 1247-1249) and contradicting the anyway suspicious year of death forwarded by the Kotô Meizukushi Taizen, there are old oshigata collections extant that show blades dated for example Kenji four (建治, 1278) and Kôan six (弘安, 1283) and ten (1287). Following the latter data means that with Kuniyoshi, we have reached the closing years of the mid-Kamakura period. Fortunately, there are relative many works of this Awataguchi smith extant and these works comprise all kind of blades like tachi, uchigatana, ken, tantô, and larger dimensioned sunnobi-style tantô. So we have a pretty good overview of his artistic repertoire, although it must be said that long swords are rarest when it comes to quantities in the extant oeuvre of Kuniyoshi. Let me work through Kuniyoshi’s workmanship step by step, beginning with long swords and coming via the “others” to his tantô. There are only two zaimei tachi of Kuniyoshi extant whose signatures are bulletproof. 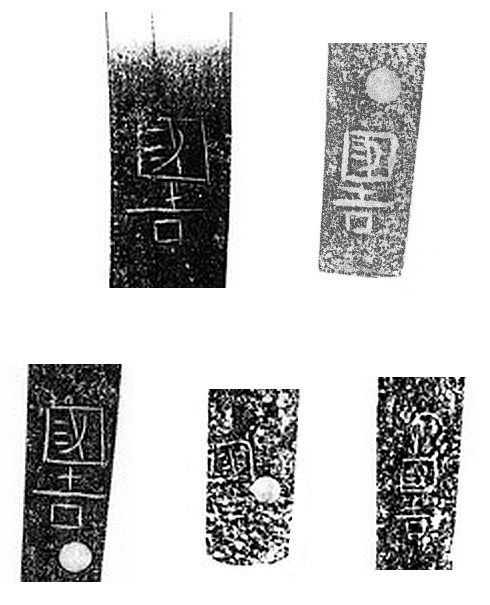 Then there is a group of three signed blades where the signature is off a little, although these mei are thought to be most likely authentic and within the range of natural changes of a smith but which are nevertheless labelled as “need further study.” In other words, the NBTHK is very very careful in this respect and does not lean an inch out of the window when it comes to big names like Awataguchi Kuniyoshi. And then there are more than a dozen of jûyô and more than a dozen of tokubetsu-jûyo tachi known which are unsigned but which are attributed to Kuniyoshi. So let’s focus on the signed specimen to define how he interpreted his long swords. One of the two bulletproof zaimei tachi (see picture 1) is tokubetsu-jûyô and it is very special because it is completely ubu. The blade has an elegant tachi-sugata with a deep koshizori with funbari but does no longer taper that much like earlier Kamakura blades and ends in a straightforward chû-kissaki, i.e. nothing like ko or slightly elongated ko-kissaki, as it was typical for preceding periods, but chû. It shows a very dense ko-itame with a little nagare, plenty of ji-nie, fine chikei, and a nie-utsuri and the steel is clear and looks “wet.” The hamon is a ko-nie-laden suguha-chô that comes with a little undulating notare and that is mixed with a few ko-gunome, ko-chôji, and ko-midare, ashi, some kinsuji, and a conspicuous, discontinuous nijûba that appears almost over the entire blade (sparing just the base). The nioiguchi is wide and bright. The bôshi is sugu with prominent nijûba and almost runs out as yakitsume. The tang is as mentioned ubu, has a kurijiri, kiri-yasurime, and two mekugi-ana. The signed jûyô-bunkazai (see picture 2) was shortened up to the signature but retains its elegant sugata that is again not that much tapering and ends in a chû-kissaki. The interpretation of the jiba is very similar to the tokubetsu-jûyô and we see the same prominent and discontinuous nijûba that focuses on the upper part of the blade and that continues into the bôshi, here even a hint more pronounced. Incidentally, this feature has already been pointed out in pre-Edo period sword publications. 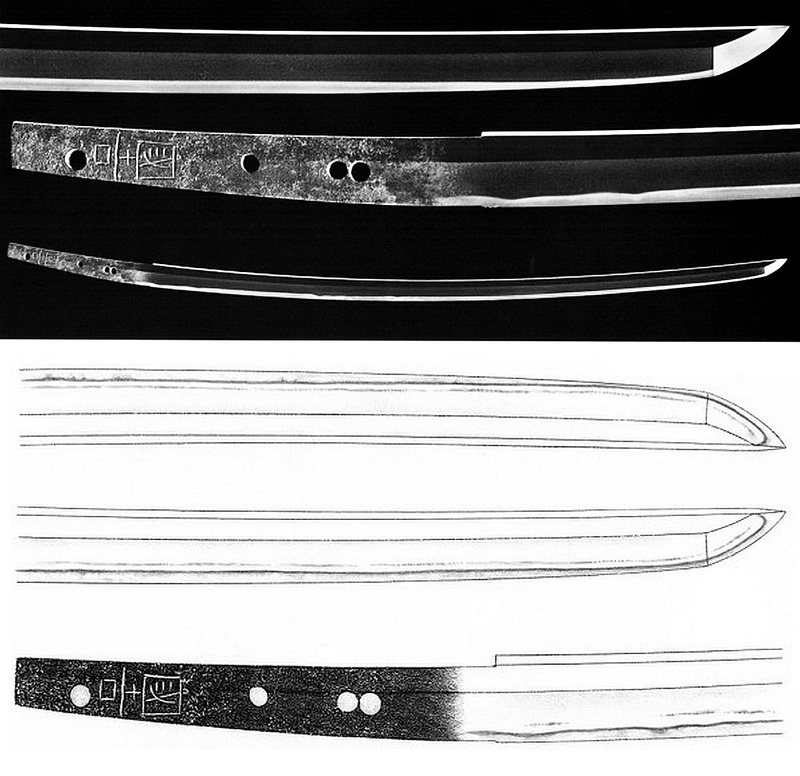 The mei of these two blades also mark so to speak the both extremes of Kuniyoshi’s spectrum of signature variations, that means the one on the tokubetsu-jûyô is the finest and largest, and the one on the jûyô-bunkazai the thickest and most compact mei. Picture 3 shows these two signatures compared to those which are as mentioned labelled as “need further study.” [Sidenote: The way these signatures are actually addressed in NBTHK papers is “to mei ga aru” (と銘がある) but this supplement deserves an extra and an explanation goes beyond the scope of the kantei series.] Again, we are talking here just about long swords. Signed tantô and ken are plenty and will be addressed later. To demonstrate what discrepancies we are facing with the “to mei ga aru” works, or rather to demonstrate the lack of discrepancies, I want to introduce in picture 4 one such blade, the one whose mei is shown in picture 3 on the bottom left. It even passed tokubetsu-jûyô, that means if the mei (and workmanship) was that off, it would not have received jûyô (or even hozon) in the first place. 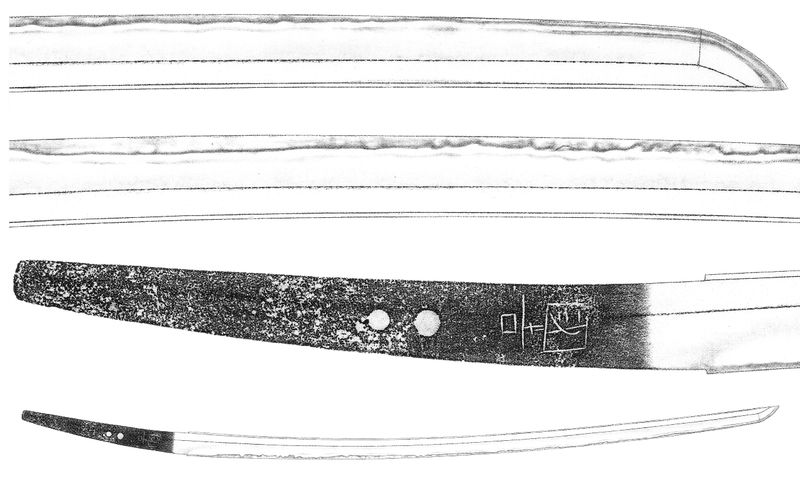 In other words, if the mei was judged as gimei (or way too off), the blade would not have passed any paper and be returned to the owner who might then be left with the decision having the signature removed and submitting it again (most likely then it would actually receive a paper on Awataguchi, or even on Awataguchi Kuniyoshi). So these to mei ga aru signatures can make it up to the tokubetsu-jûyô rank without problem and the supplement in question has to be understood as “precaution” on the part of the NBTHK. Take a look at the blade in picture 4 and judge yourself. It is a slender tachi with a deep koshizori and a chû-kissaki, showing a very dense ko-itame mixed with some mokume and nagare that features plenty of ji-nie, chikei, a hint of jifu, and a faint nie-utsuri. The hamon is a ko-nie-laden chû-suguha-chô mixed with ko-chôji, ko-gunome, plenty of ashi and yô, fine sunagashi, kinsuji, and the very same prominent discontinuous nijûba that also runs into the bôshi. The nioiguchi is wide and bright and the bôshi is sugu with a ko-maru-kaeri. The condition of this blade is outstanding. It was once owned by the statesman Ôkubo Ichiô (大久保一翁, 1818-1888) and went then into the possession of the Iwasaki family (岩崎). Now to Kuniyoshi’s “other” blades. There are about seven ken of him known of which I want to introduce the most famous one, the jûyô-bunkazai ken. I have “only” pictures of five of these blades in my database but I dare to say that the majority of them is identically interpreted. They are all slender, in ryô-shinogi-zukuri, show a thin hi along the rather high shinogi (a groove that is referred to as shinogi-hi by the way), and their tips are not that stubby (that means they don’t have a pronounced fukura). The majority has a nagasa between 21.0 and 25 cm (although there is an overlong jûyô-bijutsuhin ken with a nagasa of 84.8 cm), that means Kuniyoshi’s ken are mostly small and graceful and have a nakago that is relative long in relation to the blade length. Their jigane is about identical to that of the tachi, i.e. highest quality nashiji, and the hamon is a suguha-chô in ko-nie-deki with kinsuji and sunagashi and some ken feature a few hotsure and others a little mixed-in notare (the jûô-bunkazai for example). We also see nijûba, also not that prominent as on long swords, and at one ken, the nijûba just appears in the bôshi, meeting at the shinogi ridge (see picture 6). The jûyô-bunkazai ken is signed with a fine chisel whereas one jûyô-bijutsuhin ken bears a thickly chiselled mei, that means we can’t make out any rule when it comes to ken signatures (for example that all of them are signed the same way and would therefore go back to the same phase in his career). Next “special case” is the famous jûyô-bunkazai and meibutsu Nakigitsune (鳴狐, lit. “howling fox”) from the former possessions of the Akimoto family (秋元) which ruled the Tatebayashi fief (館林藩) in Kôzuke province. Here we are facing a long uchigatana (the jûyô-bunkazai designation says “katana”) in hira-zukuri and although this is the only one of its kind, i.e. by a famous smith from that time (Kamakura), it has some Heian-period predecessors. 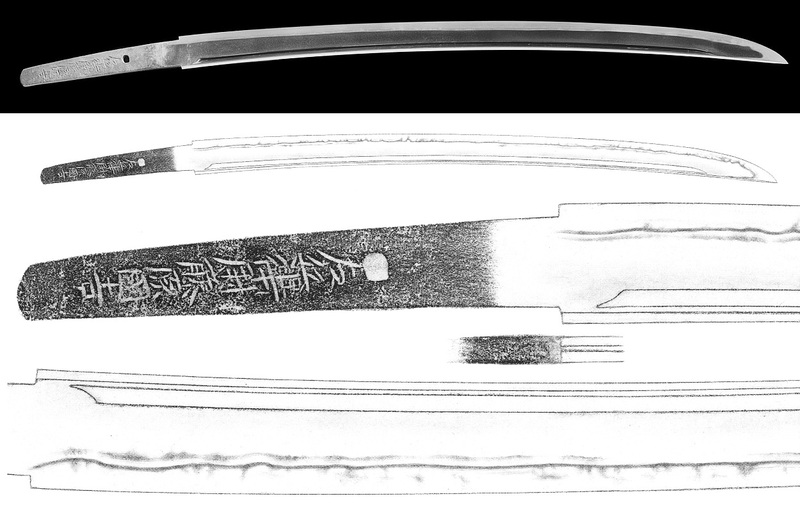 Please note that the blade shows a bôhi which is engraved very close to the mune, a characteristic feature that is typical for the Awataguchi School. However, the diagonal end just above the habaki is unique to Kuniyoshi and also found on some of his tantô. By the way, Tanobe sensei sees the Awataguchi Hisakuni tantô shown in picture 6 here from its overall impression as “miniature version” of the Nakigitsune. The jiba of the Nakigitsune follows that of Kuniyoshi’s tachi and on this blade too we see prominent nijûba. But the suguha is pretty wide and we see some ko-gunome and ko-notare along the fukura. Please check out hi-res pictures of this blade here. Tantô make the majority of Awataguchi Kuniyoshi’s extant oeuvre. There is one jûyô-bunkazai, a couple of jûyô-bijutsujin, and more than a dozen jûyô/tokubetsu-jûyô tantô, and the majority of these tantô is signed (all but one in niji-mei, the one “exception” is signed “Saemon no Jô Kuniyoshi”). When we take a look at all these tantô we learn that he interpreted them in a great variety of shapes. There are such with a standard, a mid-sized and elegant Kamakura-period sugata, smaller and wider tantô that tend to a hôchô-sugata, long and thin tantô, and long and wide tantô that come in a sunnobi-sugata. His tantô show a little uchizori or no sori at all and can come with an iori or a mitsu-mune. Also we see several kinds of grooves like gomabashi, katana-hi, katana-hi with tsurebi, combination of suken on the one and koshibi on the other side, combination of katana-hi with bonji on the hira-ji towards the base, bonji and suken as relief in a katana-hi, and futasuji-hi on both sides. As mentioned, the hi are engraved in Awataguchi-manner quite close to the mune and some end in Kuniyoshi’s peculiar diagonal manner. And before I introduce some of his tantô I briefly want to address Kuniyoshi’s standing within his school. Some see him as best tantô smith of all times whereas this attribute is mostly associated with his successor Yoshimitsu. Others say he was the best when it comes to a gentle and dignified suguha whilst Honma sensei ranks him second in his school in terms of skill, only surpassed by Hisakuni. Well, works of these Awataguchi masters are all outstanding and the quality is so close that such rankings are more of a subjective nature and not really something to fight about. Picture 8 shows the jûyô-bunkazai tantô of Kuniyoshi. It is wide and with a nagasa of 22.9 cm rather compact, what gives the piece a hôchô, i.e. “kitchen knife” sugata. It shows a dense ko-itame that is mixed with some ô-hada in places, fine ji-nie, and a hint of jifu-utsuri. The hamon is a ko-nie-laden chû-suguha that is mixed with ko-ashi, yô, and a little ko-gunome at the very base. The nioiguchi is bright and rather tight and the bôshi is sugu with a ko-maru-kaeri. Please note that this blade does not show nijûba. Both sides feature a katana-hi that is, again, arranged pretty close to the mune, and we can also see traces of a tsurebi. The tang is ubu, has a kirijiri, kiri-yasurime, and is signed in niji-mei. Incidentally, this blade was once a heirloom of the Asano family (浅野), the daimyô of the Hiroshima fief of Aki province. In picture 9 we see a tantô of Kuniyoshi that features prominent nijûba, also in the typical manner what means interrupted and a hint more emphasized in the bôshi. This is, or rather was Kuniyoshi’s largest known tantô, was because it is a little machiokuri. It measures now 29.1 cm but was originally 30.9 cm in nagasa. So this tantô comes in sunnobi-sugata and somehow foreshadows the later Nanbokuchô interpretations. The jigane is a very dense ko-itame with plenty of ji-nie and appears altogether as nashiji-hada. We see a little mixed-in jifu and a prominent nie-utsuri. The hamon is a ko-nie-laden chû-suguha-chô mixe with a little notare and, as mentioned, nijûba. The nioiguchi is bright and the bôshi is sugu with a kind of ô-maru-style kaeri. 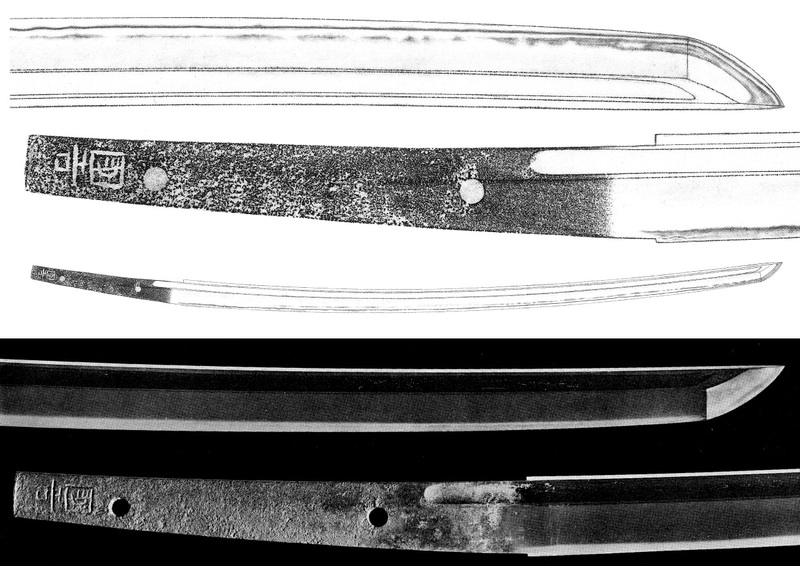 Both sides bear a katana-hi with tsurebi. The tang is machiokuri, has a kurijiri, kiri-yasurime, and shows a thickly chiselled niji-mei. And last but not least I want to introduce another tantô of Kuniyoshi, a jûyô-bijutsuhin, that shows the diagonal ending of his hi that I have mentioned several times. This tantô – which was an heirloom of the Aoyama family (青山), the daimyô of the Sasayama fief (篠山藩) of Tanba province by the way – is with a nagasa of just 20.4 cm pretty short and tends with the wide mihaba to a hôchô-sugata. The jigane is a dense ko-itame with plenty of fine ji-nie and nie-utsuri and the hamon is a chû-suguha in ko-nie-deki that is mixed with ko-ashi and yô and that thins somewhat down towards the fukura. Please note the ko-ashi at the base which make the hamon there tend a little bit to ko-gunome. This feature anticipates a typical characteritic of Kuniyoshi’s successor Yoshimitsu (which will be addressed in detail in the next chapter) and that is why I am introducing this tantô here. Also we see nijûba, although here just at the base, and some hakikake along the relative wide ko-maru-kaeri. And to get a feel for the brilliance, the outstanding and breath-taking quality of the Awataguchi steel, I would highly recommend checking the photo gallery at the very bottom of Darcy’s site here!